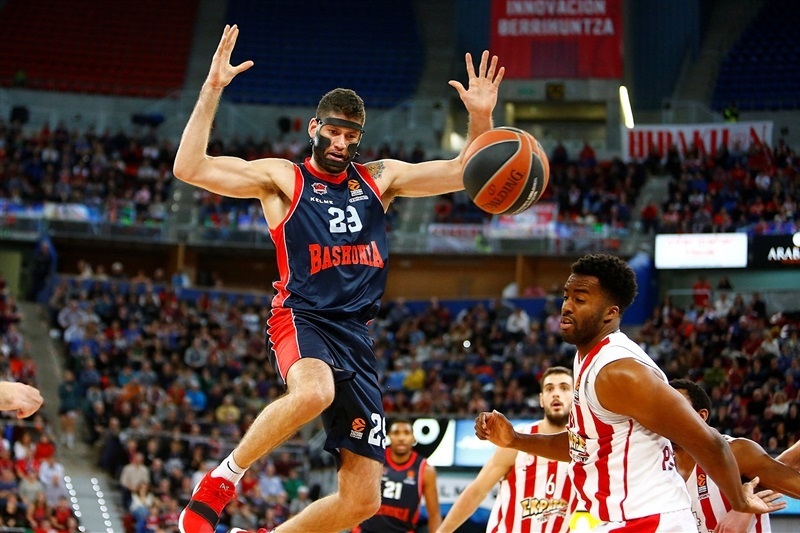 Baskonia Vitoria Gasteiz got back on the winning track by thrashing Olympiacos Piraeus 86-54 in front of more than 10,000 fans at Fernando Buesa Arena on Friday. Baskonia improved to 8-9, one spot behind the playoff positions, and Olympiacos dropped to second place at 12-5. Johannes Voigtmann led the winners with 19 points, while Vincent Poirier and Rodrigue Beaubois each had 13. 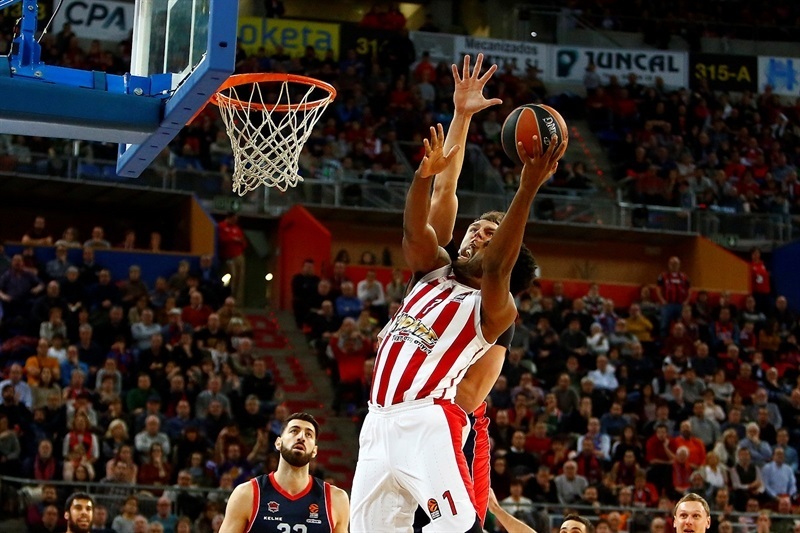 Georgios Printezis led Olympiacos with 13 points. Early three-pointers by Vangelis Mantzaris, Printezis and Vassilis Spanoulis allowed Olympiacos to get a 16-21 lead after 10 minutes. Patricio Garino and Luca Vildoza helped Baskonia to get a 36-30 edge at halftime. Baskonia kept excelling on defense after the break and an outstanding Voigtmann allowed the hosts to boost their margin to 55-36. 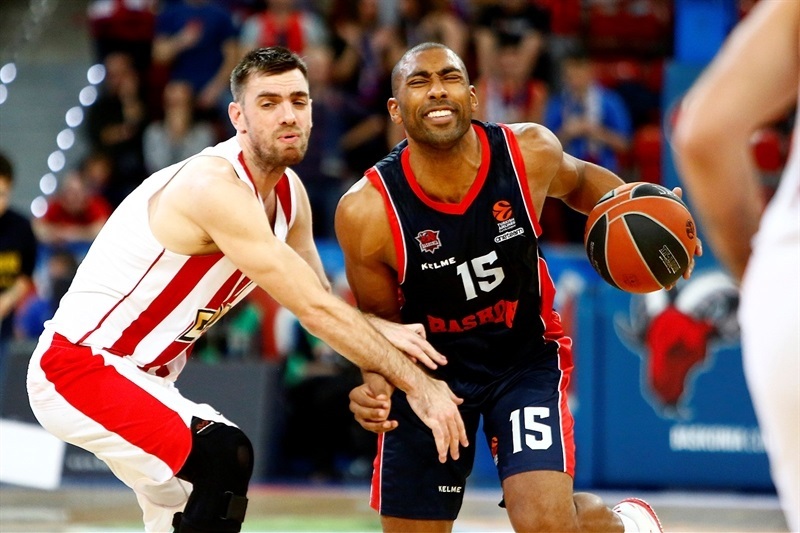 Olympiacos could not find the way to the basket and Baskonia had 36 points in the third quarter, one shy of its club record. 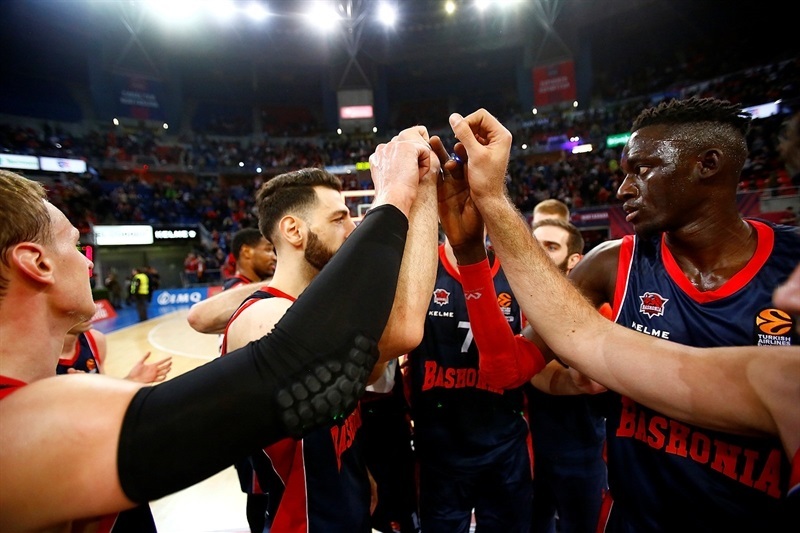 Nothing changed after that, as Baskonia cruised to a well-deserved, historical win. 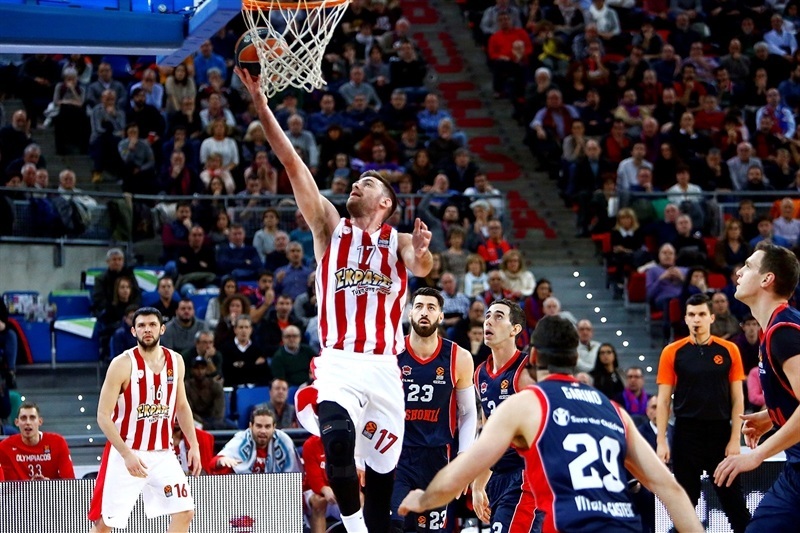 Mantzaris and Printezis each struck from downtown in Olympiacos's 0-8 opening run. Poirier stepped up with a put-back layup and a three-point play and Beaubois added a couple of fastbreak baskets. 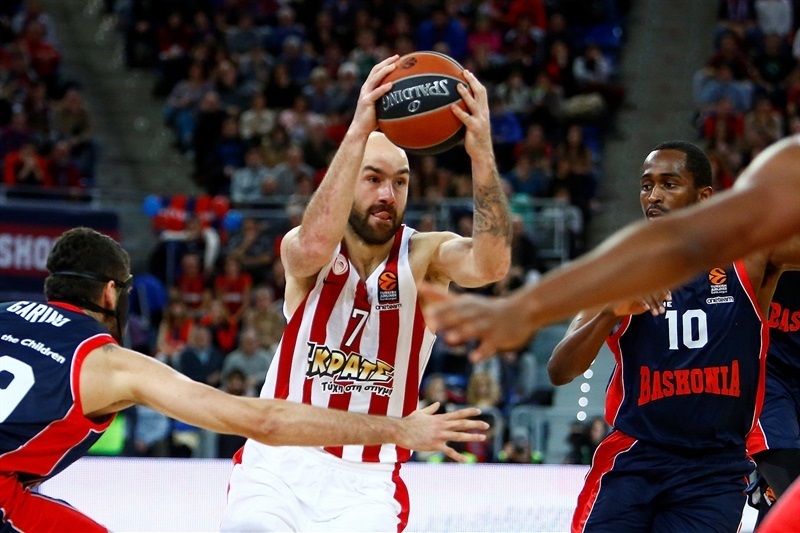 Printezis scored again and Spanoulis buried a couple of triples for a 10-17 Olympiacos margin. Toko Shengelia sank a jump-hook and Voigtmann followed a close basket with a wild alley-oop slam to keep Baskonia within 16-21 after 10 minutes. Voigtmann kept pacing the hosts with a dunk-and-free throw combination early in the second quarter. 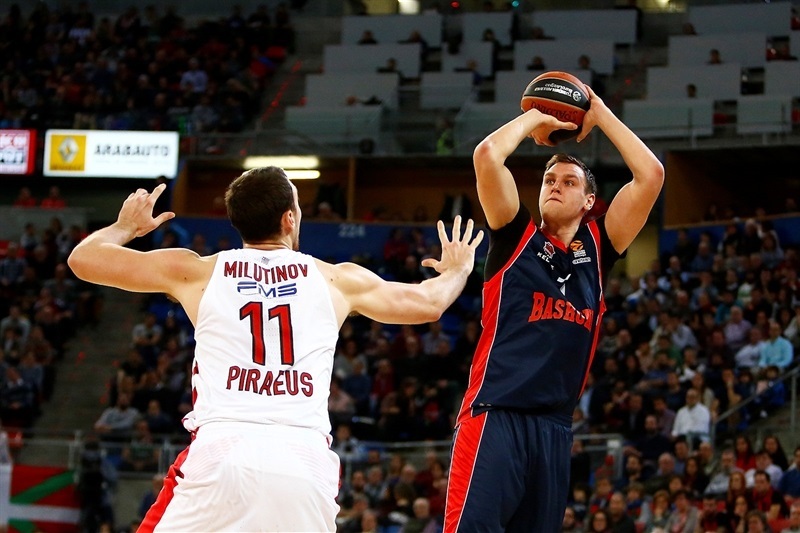 Kostas Papanikolaou scored in penetration and Printezis added back-to-back floaters, but Poirier, Matt Janning and Beaubois kept Baskonia within 27-29. 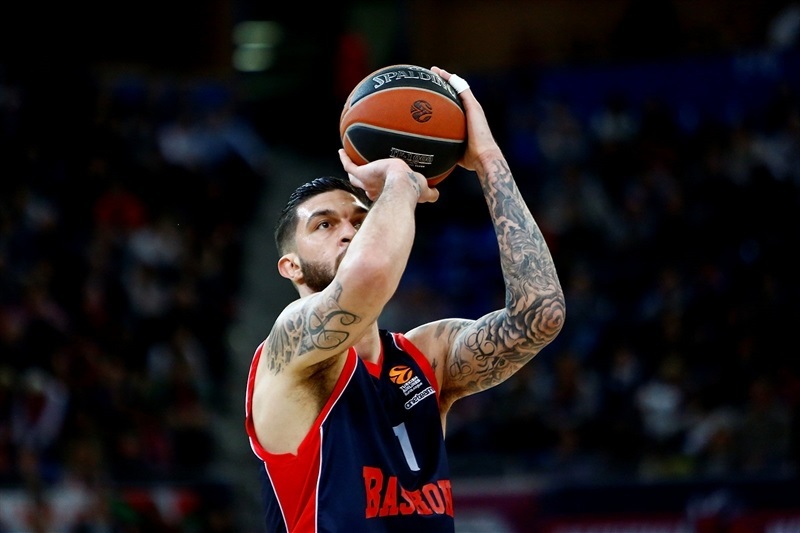 An unstoppable Poirier dunked and Garino followed a corner triple with a coast-to-coast layup to give Baskonia its first lead, which Vildoza boosted to 36-30 at halftime. Jayson Granger scored in transition right after the break. Beaubois added a coast-to-coast layup and Voigtmann scored down low to make Olympiacos call timeout at 42-30 after a 16-1 Baskonia run. Printezis tried to change things with a layup and Jamel McLean added a couple of driving baskets but Shengelia, Beaubois and an outstanding Voigtmann broke the game open at 53-36. 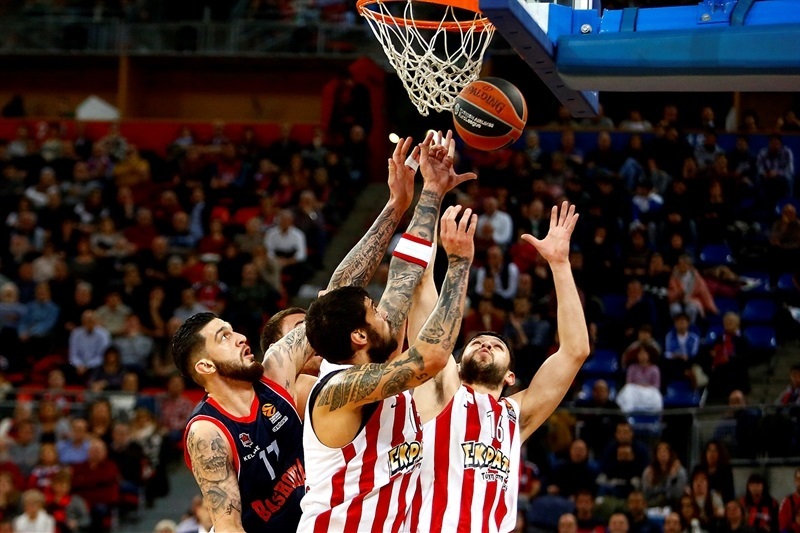 Olympiacos kept struggling to score while free throws by Beaubois and three-pointers by Voigtmann and Janning sealed the outcome, 66-37, with a lot of time left still. 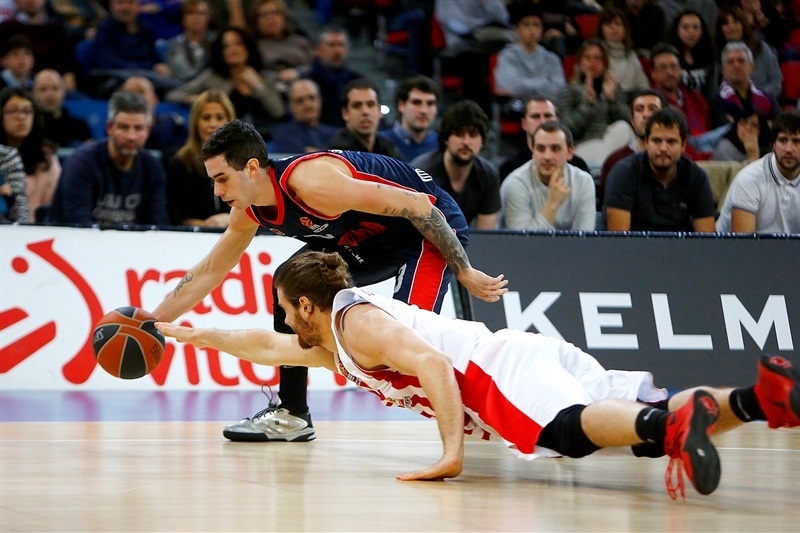 Vildoza and Shengelia kept Baskonia way ahead, 72-44, after 30 minutes. 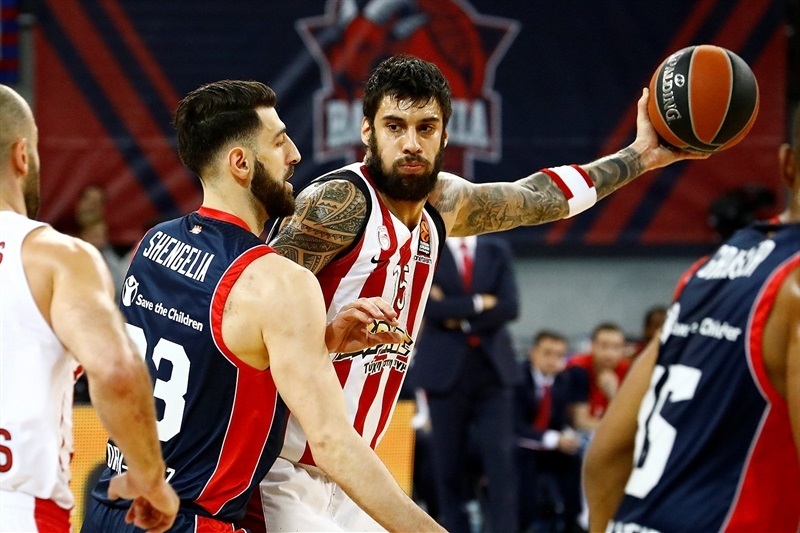 The outcome was clear but Olympiacos kept fighting to at least try to get the tie-break advantage after having beaten Baskonia 75-64 at home. 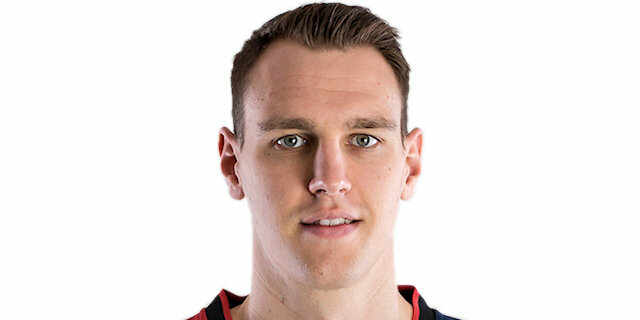 Baskonia kept excelling on defense, however, and a three-pointer by Janning made it a 34-point game, 78-44, enough for all Baskonia fans to celebrate a huge win. Both teams return to Turkish Airlines EuroLeague action early next week. Olympiacos welcomes Maccabi FOX Tel Aviv on Tuesday and Baskonia visits Real Madrid on Wednesday. 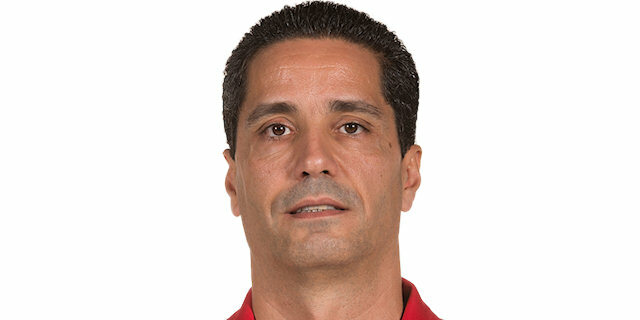 "It is always better when we play together, passing the ball and making a good team defense. We are very happy - Olympiacos is a great team that today, after the second quarter, was very bad at three-point shooting and that was good for us. In our way, we rebounds very well, run the floor very well and had a great contribution from players coming off the bench. We are very happy but have a new, tough game in 48 hours and we have to be ready. 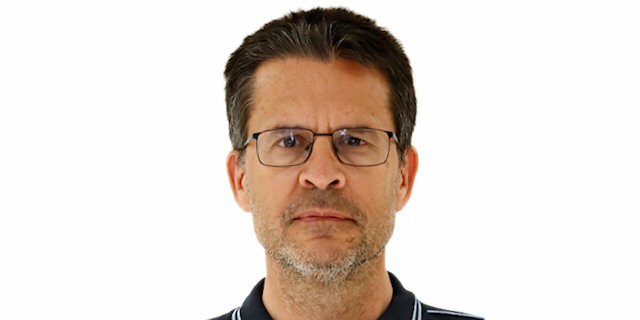 We are happy with all of our players - we need everybody. Some days, some player is going to play more and other day, another one will do it. We have to stay together, working hard and thinking on the next game. It was an all-around game. We played good defense and they had poor offense, not hitting shots after the first quarter. We played with a very good defensive rhythm, rebounding very well and running the floor really well. I hope we can carry on doing that, I have to highlight that because the goal is that this happens more times. Maybe not as good as scoring 36 points in one quarter, like we did today, which is extraordinary. That cannot be a goal, but the mentality to be able to rebound the ball and run has to be an example for us to get better. I am happy with the win, which allows us to keep fighting for a playoffs spot." "I don't have to say a lot about the game, the score talks about how was the game. Congratulations to Baskonia, they played really well. We were completely out of the game after the first period. I think we lost our concentration, that is the reason (why they lost this way). We were very nervous, missed some open shots and this damaged our concentration. And after that, we collapsed." "I think I defended pretty well and tried to run every time. That was our goal, as a team, together: to get easy baskets, and I think we accomplished that. We made them run a lot ad got easy baskets, and that is very important against a defense like that. We try to accomplish being consistent and get as many wins as possible. We desperately this win to be close to the playoffs. We just need to keep winning, especially at home - it is very important for us."